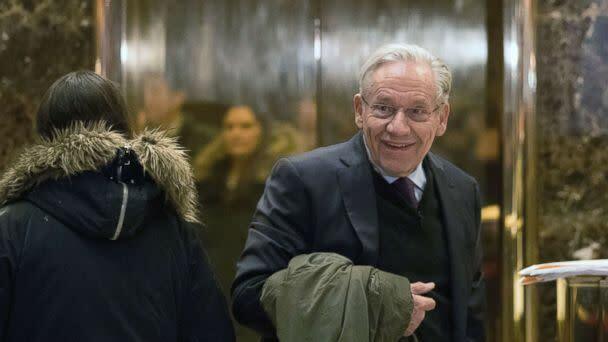 After covering every president since Richard Nixon, Bob Woodward, the legendary journalist for The Washington Post and author, has turned his focus to this president. "Fear: Trump in the White House," which came out Tuesday, is the truth, Woodward said, about an administration headed by a man he describes as "emotionally overwrought, mercurial and unpredictable," and it's already engendering outrage from President Trump himself. "Too many people are disturbed and worried about what's going on in the Trump White House. And the public can't kind of pretend this isn't occurring. We need to, if you will, wake up and address it," Woodward said in an interview with "Nightline." Since copies of the book were leaked last week, Trump has come out and said it is "a work of fiction," and several members of Trump’s cabinet who are mentioned in the book have issued denials for many statements attributed to them. But Woodward stands by every word. "I've found in 47 years of reporting when people have denied things or challenged things and I've done my careful, meticulous work, that then they will in their own memoirs come and say, 'Oh, yeah, by the way, that was true,'" he said. 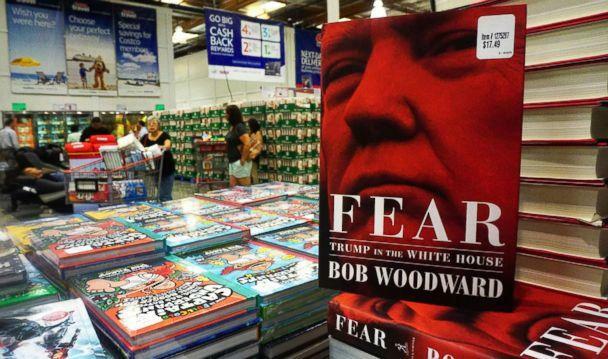 The title, "Fear," Woodward said, was inspired by the president’s own words. "Trump in an interview two and a half years ago… said… 'Real power is fear,'" Woodward said. "And that's an expression of the way he wants to operate by scaring people. So it's right out of his own mouth." The book opens with a scene that Woodward describes as an "administrative coup d’etat." Woodward said the president’s now former chief economic adviser, Gary Cohn, allegedly stole a document off Trump’s desk that would have pulled the United States out of a trade agreement with South Korea. Cohn feared that pulling out of the deal would jeopardize U.S. national security by unraveling the intelligence-sharing partnership between the U.S. and South Korea, which allows us to detect a North Korean missile launch within seven seconds, according to Woodward. "Cohn's argument to a colleague is, 'I'm protecting the country,'" Woodward said. "I've never seen or heard of something like that occurring. It's part of the breakdown of the presidency in the Trump era where people are doing things like that. In their eyes, [it’s] an act of conscience, an act of courage to protect the president from doing this and also protect the country." Woodward called it "a nervous breakdown of the executive power of the most powerful country in the world," and said the White House staff joined together to "purposefully block some of what they believed were the president’s most dangerous impulses." Another example of this, according to Woodward, occurred when images surfaced showing Syrian President Bashar Al Assad had launched a chemical attack on unarmed civilians. Woodward said there was a moment where the president called Defense Secretary Jim Mattis and said, according to Woodward, "Let's ------- kill him!... Let's go in. Let's kill the ------- lot of them." "It was kind of, 'Let's get the ----er,' and he wanted him killed," Woodward said. "And Mattis, the Secretary of Defense, former general, was very deferential, 'We'll get right on it.' And then he turned to an aide and said, 'We're not going to do that. We're going to come up with more reasonable measured options.'" Woodward’s book portrays a president who seems dangerously uninformed, incurious or immovable. According to Woodward, there was a moment where the president said to Cohn that the government should just print money. "This is before Cohn was hired," Woodward said. "Jared Kushner, the president's son-in-law said, 'You ought to bring Gary Cohn up and meet him and listen to him,' and in the meeting the president said, 'Well, we should print money,' and Cohn said, 'No, no, we can't do that because we'll increase the deficit. It will really hurt the economy. We have to be careful about that,' and the president did not understand." "Basic economics, the president does not comprehend," Woodward continued. "And there's scenes in the book where they are trying to point out to him that 99.9 percent of the economists don't worry about trade deficits with individual countries… And they ask him where he got these ideas. He said, 'I've had these ideas for 30 years.'" Cohn issued a statement, in which he didn’t cite specific objections to details mentioned in Woodward’s book, but said, "This book does not accurately portray my experience at the White House ... I continue to support the president." "Fear" contains many scenes of what Woodward said are advisers pleading with the president to respect long-time trade deals and military alliances, only to have their efforts rebuffed. Woodward said that in July 2017, Cohn and Mattis together decided that they needed to, according to Woodward, "somehow control the president" and "get him to buy into the old world order." They had the president meet with the two of them, as well as Sec. of Treasury Steve Mnuchin and now former Sec. of State Rex Tillerson, in the Joint Chiefs of Staff meeting room, also known as "The Tank," said Woodward. "And Mattis said at the beginning, 'This is this great gift from the greatest generation that this world order where we hold things together' ... and Trump would not accept any of this," Woodward said. "At the end of the meeting, Sec. of State Tillerson said to others after Trump left ... 'Trump, is a ------- moron,' and Mattis was just deflated," Woodward stated. "In fairness to Trump, he's a disrupter," Woodward continued. "He's somebody who was elected to change things. But you can't kind of come in and tear up the old order completely." The book claims to take the reader inside the White House during key moments of the Trump presidency. "I've talked to reporters who cover the Trump White House who've called me and said, 'This is it. This is exactly what it's like, and a lot of this stuff gets kept from the public because people say things off the record, and [they] kind of believe they're protecting themselves and the president,'" Woodward said. One of those moments the book delved into is describing the aftermath to Trump’s reaction to the white supremacist march in Charlottesville last August that resulted in one person being killed. After his initial comments created an uproar, in which the president appeared to go soft on neo-Nazis when he said there was blame "on many sides" for the violence that erupted, Trump was persuaded to deliver a second, more conciliatory, scripted speech on Aug. 14, 2017. "No matter the color of our skin, we all live under the same laws, we all salute the same great flag," Trump said during this second speech. "Racism is evil. And those who cause violence in its name are criminals and thugs, including the KKK, neo-Nazis, white supremacists, and other hate groups that are repugnant to everything we hold dear as Americans." Afterwards, the public reaction was largely positive, complimenting him for admitting he was wrong, much to Trump's fury, Woodward said. The president later reversed himself. "And then Trump watched Fox News and saw that someone said, 'Well, this speech was a course correction,'" Woodward said. "And soon Trump was talking about, "That was the F-ingest worst speech I ever gave. How could I do that? Who talked me into it?' And so then the next day he went back to his original position that the problem here is "both sides.'" The Trump White House is often paralyzed by special counsel Robert Mueller’s Russia probe, according to Woodward. He said there were tensions between the president and his now former personal attorney, John Dowd. Dowd was worried that the president would perjure himself in any sit-down interview with the special counsel, Woodward said, and to prove it to the president, Dowd set up a mock interview. "It was kind of a practice session at the White House, Jan. 27th this year, and Dowd ... asks questions ... as if he were Mueller, and then Trump is going to respond, and Trump goes ballistic," Woodward said. "[He] says things that are not true ... After they go through this, Dowd says to the president, 'Look, see, you can't testify. You would be a terrible witness.'" Afterward, Dowd went to Mueller and demonstrated what happened, role playing with another presidential attorney in front of the special counsel, to show Mueller that the president couldn't testify, according to Woodward. The issue of testifying lead to many strained conversations between Dowd and Trump, which Dowd found "very anguishing," Woodward said. "[Dowd] said, 'This is breaking my heart, but I cannot sit next to you as your attorney and have you not tell the truth.' He says, 'If you testify, it will be an orange jumpsuit,'" Woodward said. "And the president [has], at that point, decided he's going to testify, and Dowd says, 'then I cannot stay on as your attorney,' and he resigned." In fact, Woodward said that Dowd concluded that the president is an "------- liar" but, Woodward said, Dowd "can't bring himself to tell that to the president." Dowd has disputed Woodward’s account, saying in a statement that "there was no so-called 'practice session' or 're-enactment' of a mock interview at the special counsel’s office. Further, I did not refer to the president as a 'liar' and did not say that he was likely to end up in an 'orange jumpsuit.'" Behind closed doors, rampant insults fly between the president and his many advisers, according to Woodward. In the book, the president called Attorney General Jeff Sessions "mentally retarded" and "a dumb Southerner," suggested that his generals didn't know what they were doing, and compared his now former Chief of Staff Reince Priebus to a rat, Woodward reported. In his many years of covering presidents, Woodward said he sees similarities to President Nixon, especially in the remarks Nixon was heard making on his secret recording system. "There are lots of things said by Nixon about people which are quite insulting," Woodward said. "A White House administration and cabinet needs to somehow be a team, needs to work together. And they're not working together. And Priebus, in the end, concludes that the Trump White House is like 'a zoo without walls,' and someone's a rat and someone's a mole and somebody's a this, and they're all fighting each other. They are chaos creators." Trump’s advisers have done their fair share of insulting the president, Woodward said. He wrote that Tillerson called him a "------- moron," his current Chief of Staff John Kelly called him an "idiot," and Mattis compared Trump's understanding of foreign affairs "to a fifth or sixth grader." In his experience covering so many administrations, Woodward said this situation "is clearly extreme." "This is serious, and it's not a team," Woodward said. "And if we have a real crisis, how do you put all this together? How do you get information? How do you evaluate it? How do you determine what's real? You can't create an alternative reality when we have to deal within this country in a world with a reality that people, there is a consensus, 'Yes, that's real.'" Current members of the administration have pushed back on the book’s reporting. Sec. of Defense Jim Mattis said, in part, "The contemptuous words about the president attributed to me in Woodward’s book were never uttered by me or in my presence," adding that he would never show contempt or tolerate disrespect to the president. In his statement, John Kelly said, in part, "The idea I ever called the President an idiot is not true." Kelly added, "He always knows where I stand, and he and I both know this story is total BS ... This is another pathetic attempt to smear people close to President Trump and distract from the administration’s many successes." Woodward defended his reporting of the Trump administration, pointing out that he has audio tapes of most of the interviews. "When I was doing hundreds of hours of interviews… and I said, 'It's deep background, recorded with their permission, everything will be used, but I won't say where it came from,' And people would say, 'Well, let me tell you this off the record,' I said, 'No, nothing off the record. We've got to stop playing that game,'" Woodward said. "Interestingly enough, people would then say, 'Oh, okay,' and tell me on background in a way that I could use it in the book." In fact, just last month, Woodward said he recorded a conversation with President Trump himself. During the conversation, the president acknowledged that he is allowing Woodward to record the conversation and then seemed to bemoan the fact that Woodward never interviewed him for the book. Woodward then told the president he had made several requests to interview him, but was denied each time. "I just spoke with Kellyanne [Conway] and she asked me if I got a call. I never got a call. I never got a message. Who did you ask about speaking to me?" the president said to Woodward on the phone. "Well, about six people," Woodward replied. The details of the book made headlines before its release Tuesday, and with two months left before the midterm elections, it remains to be seen whether Woodward’s words will change any minds. "I think if anyone looks at it objectively and goes, 'Gee, they're saying this happened on this date and there's the document printed in the book' ... I think an objective person can look at it and say, 'You know, this has a ring of truth,'" Woodward said. Woodward hopes "Fear" will be a historical document that allows Americans of all stripes to come to informed conclusions. As for his own personal opinion on whether he believes the president is fit for office, Woodward said, "that’s not for me to decide." "My job is to be the reporter," he said. "Let people in the country or the political system look at what's occurring, and I would argue that's their job, not mine."